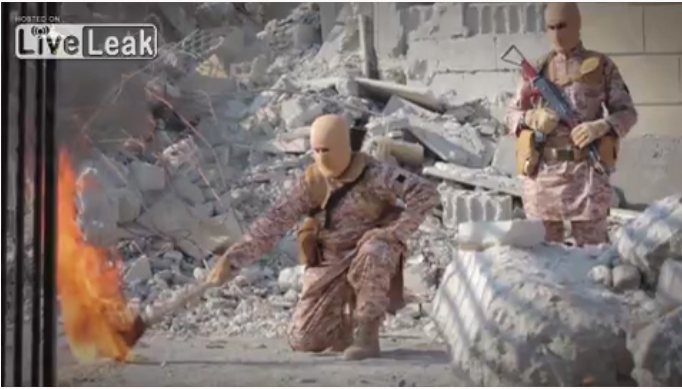 ISIS released a video on Tuesday of its execution-by-incineration of the pilot, who was captured in December after his plane crashed in ISIS controlled territory. 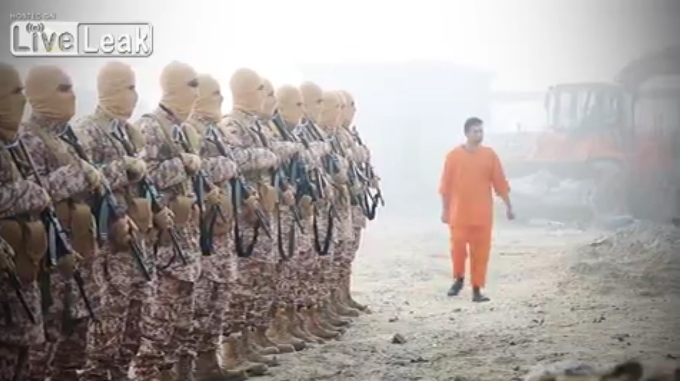 ISIS had been threatening to execute him if their zealots jailed in Jordan were not released. ISIS allowed the victim to observe damage he had done dropping bombs as a way of acknowledging his guilt and that he was deserving of the death that was about to be inflicted on him. He may not have known beforehand how he was going to die. ISIS film editing turned him into an actor in his own snuff film. This of course is absurd. ISIS is Islam 101. Islam has a 14-century history of using terror to impose itself, starting with Muhammad, the creator of Islam. Usually it was just matter of cutting throats, lopping off heads, running people through with spears and swords, or shooting them with arrows. Islam is known as the “religion of the sword,” which was the weapon of choice. But even this particular mode of killing by fire has precedents in Muhammad’s behavior, his Sunna, and therefore it is allowable to the people of ISIS, who strictly model their behavior on Muhammad’s example. Take for example the Dirar Mosque incident, a mosque in Medina Muhammad denounced as the “mosque of dissidence” and ordered it burned down. This occurred in A.D. 630 upon his return from the Tabuk raid at the head of 30,000 men who were disgruntled because nothing had been conquered so there was not any plunder to pay them with. The operation had targeted the Byzantines, but they were nowhere to be found. It is evident from the literature some of his people attempted to kill him on the return trip, and paranoid that dissatisfaction with him over lack of booty could get out of hand, he ordered the destruction of a recently built mosque as a warning to dissidents. A believer in the religion of Muhammad lights gasoline that had been poured on the ground outside and inside the cage. The pilot’s clothes had also been soaked with gasoline so that he was turned into a human torch. Another documented burning took place just prior to the Tabuk raid. 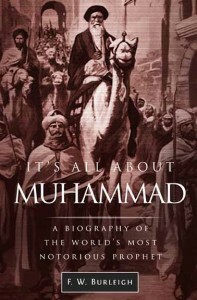 Muhammad ordered a house to be burned down where people had congregated who objected to joining the raid. Zealots surrounded the house and torched it. Most of the occupants escaped, some by jumping from the roof, but the owner, a Jew, was incinerated. The traditions about Muhammad also contain a number of stories of him threatening to burn the houses down — occupants inside — of people who failed to show up for the obligatory prayers, and he may have actually done so on one occasion. Islam is all about Muhammad’s Koran and his Sunna — the example of his behavior. Abu Bakr al-Baghdadi, the self-declared caliph of the so-called Islamic State, is supposed to have the equivalent of a Ph.D in Islamic literature, meaning that he is well versed in these burning precedents. ISIS gunmen watch the pilot burn to death. 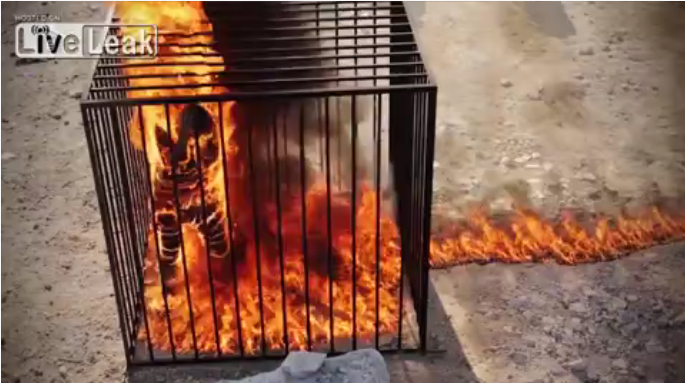 An ISIS propaganda video showing this barbaric execution is entitled the “Healing of the Believers’ Chests.” It is not clear what ISIS meant by this, but it is likely related to Muhammad’s idea of purification through punishment, a concept that is central to Sharia law. The idea is that if the sinner repents and accepts the punishment that is due in this life under “God’s law,” then Allah will forgive him and spare him the punishment of the fires of hell. 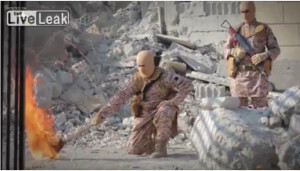 This perhaps explains the apparent calmness of the Jordanian pilot as he walks to the cage on his own and stands with resignation as the flames come toward him. He had been under ISIS control for more than a month, enough time to convince him that he was an apostate who deserved death, but that he would be spared the flames of eternal punishment through repentance and purification through the death penalty. His judge-killers calmly watch and are certain the fires of this world will spare this repentant soul from the fires of hell. Islam is indeed a bankrupt ideology. Any ideology is bankrupt that has to rely on terror to impose itself and to ensure against defection. This execution and other recent ISIS atrocities show the image of Muhammad, repugnant, corrupt, paranoid, grandiose, psychopathic. It is the image of a man who could preside with gloating satisfaction over the beheading of 900 men and boys and order the assassination of others for refusing to accept him as their prophet. A man who raided and plundered and enslaved . . . and burned people to death. There is no mystery about Obama’s reaction to the ISIS atrocity. He was raised in a Muslim environment during critical years of his childhood, and his actions of the past six years show he is in alignment with the Muslim agenda. His pronouncement before the United Nations that “the future must not belong to those who slander the prophet of Islam” is nothing if not a statement of his true belief. 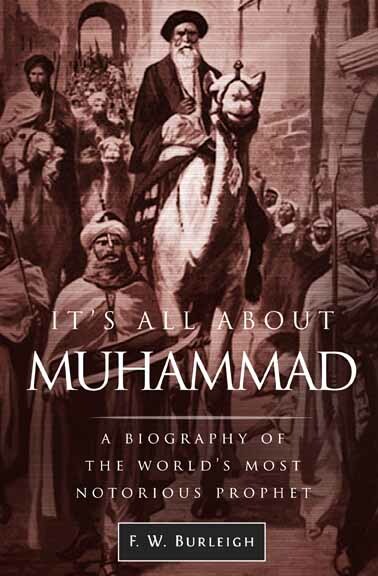 He is the typical product of the brainwashing of Islam, which holds that Muhammad was the greatest and most perfect man ever to exist. If you still have eyes that can open, then open them Obama. 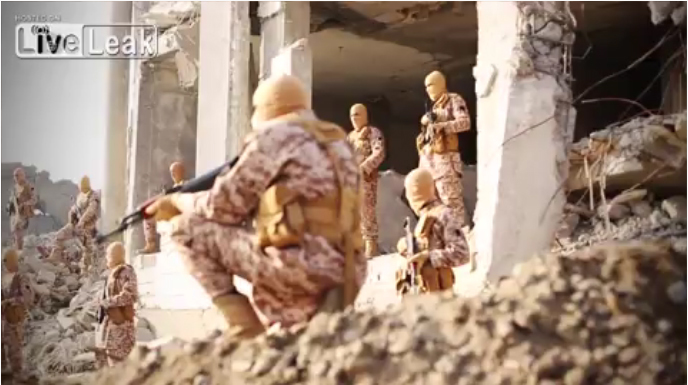 Take a good look into the mirror that ISIS is holding up. It is holding it up to you and to the entire world. It is the image of true Islam.